How does Alyss Heart of Wonderland fare after the creation of Everqueen, as described in Arch Enemy, the third volume of the best-selling Looking Glass Wars trilogy? With difficulty. Fending off political assaults from rival suit families, struggling to maintain diplomatic relations with the tribes of Boarderland, Alyss is more vulnerable than ever before. After she barely escapes an attempt on her life, no longer sure whom to trust, she aligns with controversial new allies in order to keep Wondertropolis safe and prevent havoc on Earth. And yet the fight, the battle, finds heras it seemingly always doesand Alyss discovers that all decisions, even the right ones, have consequences. Literary Sleuth and world creator Frank Beddor dared to expose the true story of Wonderland in the "New York Times" bestselling young adult trilogy "The Looking Glass Wars." To satisfy the awakened curiosity of his readers he continued to tell the parallel adventures of Royal Bodyguard Hatter Madigan s search for the lost princess in the graphic novel series "Hatter M." He lives in Los Angeles. Curtis Clark was raised the son of a farmer in the small town of Wacousta, MI. His work has grown from picking rocks to building worlds. As a lifelong comic book fan, he couldn t be more excited for the publication of his first graphic novel. Curtis currently lives in Los Angeles where he also writes for film and television. 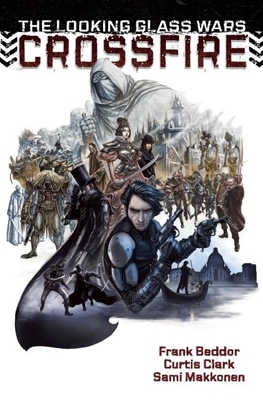 Finnish artist Sami Makkonen illustrated the graphic novels "Blue" (2008) and "Deadworld Slaughterhouse" (2009) for Desperado before signing on to visually document the travels of Hatter Madigan. A first place recipient of the 2007 Sarjis award for best fantasy comic (writer and illustrator) Sami is a graduate of the University of Tartu Estonia and has illustrated web comics for Chemistry Set and Split Lip as well as CD covers for Finnish artists Rodsogarden and Anssi Kela."